Peter of Waltham was an archdeacon of London, about whom little is know except that he died around 1196. His one surviving work is a sort of summary of the vastly longer 'Moralia In Job' by St. Gregory the Great. This copy was owned in the Middle Ages by the Benedictine priory of St. Felix, Felixstowe, in Suffolk, which was a cell of Rochester Priory. 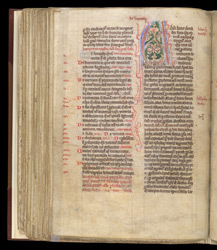 This is the start of Book III, part II, introduced by a large decorated initial 'A'. The left column has a numbered list of the chapters; this and the heading at the top of the page indicates that this first chapter is concerned with virtues (De virtutibus). The rubrics in the right-hand margin show which parts of the Moralia are being referred to (Book II and Book XXVII).